In 1989, LEGO pulled a Genre Shift on the Space theme from the semi-plausible 20 Minutes into the Future motif into full-on soft sci-fi adventure. With this shift came the introduction of several factions, one per release (with the exception of the original two), all tied together into a loose narrative through increasing amounts of fluff text and art found in pack-in catalogs, instruction manuals, and tie-in comics. 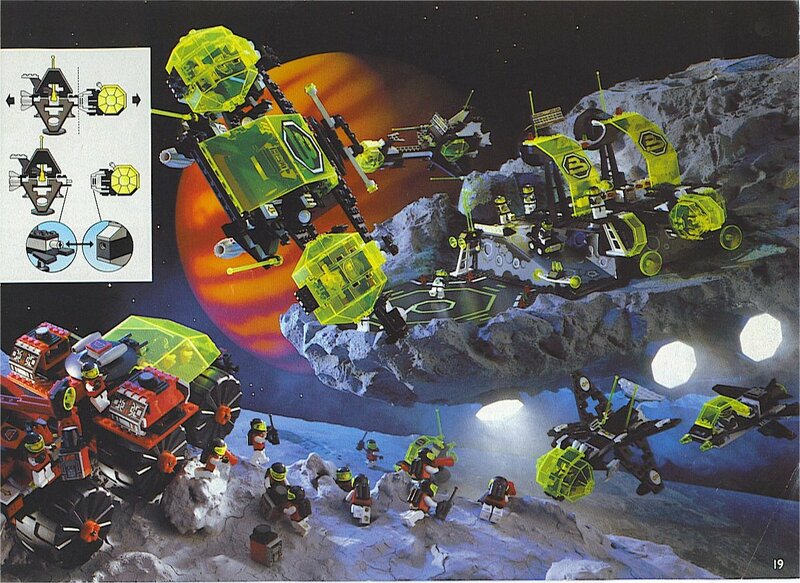 LEGO Space ran in this format from 1987 (the basic design of Classic LEGO Space carried over into the Futuron faction) to 1999 (the final release in the Insectoids line). LEGO Life On Mars and anything that ran afterward are generally counted separate from this era, as there was a two-year hiatus between and the end of Insectoids and the start of Life on Mars, its stylistic technological shift back to a more probable near-future and the inclusion of two separate factions under the umbrella of a single set banner. 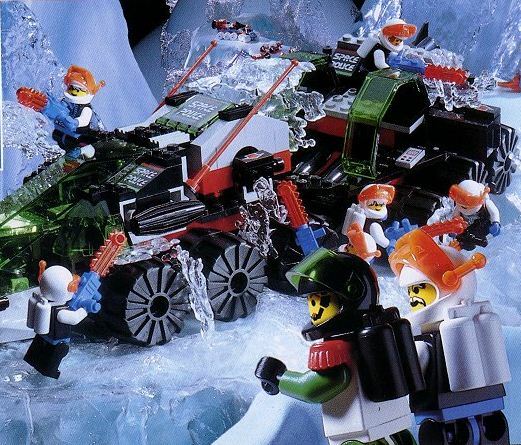 Rock Raiders, strangely, is never counted as any sort of LEGO Space at all despite being explicitly set on a foreign planet and being released immediately after Insectoids. 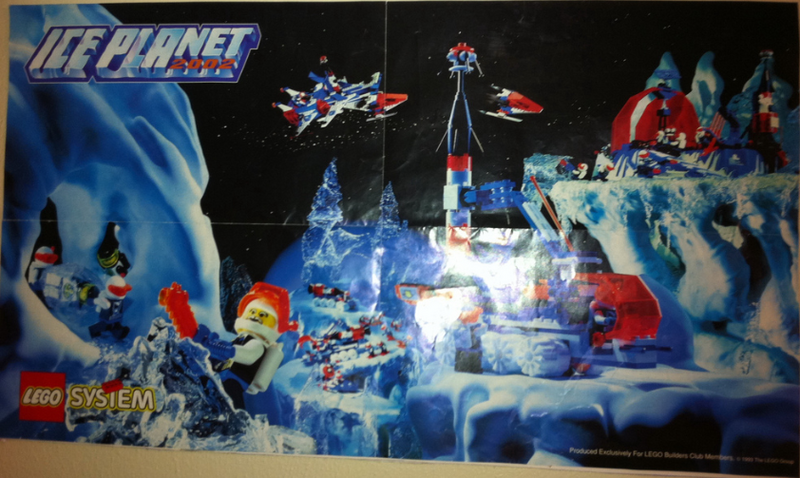 See also: LEGO Space Police, which partially ran concurrently, is counted as such and has sections here, but has its own page; and LEGO Alien Conquest, a science-fiction-related LEGO theme set on an Earth city. Absent Aliens: Up until the release of UFO in 1997, at least. The Aesthetics of Technology: Even the first sets following Classic LEGO Space are incredibly streamlined compared to the oblong, boxy designs that came before, and between this and the Genre Shift theyre considered to be far more advanced. Casual Interstellar Travel: Several factions are explicitly mentioned to be civilian in nature and their levels of technology seem roughly equivalent to those of the more militant factions. Color-Coded Armies: Each faction has its own color scheme (as well as its own general design convention), lending some personality to each and making it extremely easy to tell one from another. Custom Uniform: If a faction has a designated leader his uniform will visibly reflect it, usually ranging from some extra Tron Lines on his helmet to fancy, formal shoulders. Detachment Combat: The larger the set, the more likely it can divide into multiple vessels or transform its components into another vehicle. This, sadly, doesnt include the various bases. Drop Ship: Most large ships function as this on a small scale, transporting one or two small land vehicles that lock into and out of the main chassis. Humans Are Yellow: No, not that yellow. In all fairness, this was just the standard LEGO minifigure skin color at the time they were made. In Space, Everyone Can See Your Face: With the odd villainous or alien exception, all space helmets feature a transparent (as well as theme-colored) visor which clearly displays the minifigures face. Planet of Hats: More like Culture of Hats, since only one faction centers around a particular planet. Power Trio: Not in terms of individual characters but whole factions. The Space theme was patterned out so that with each release and each continuation there would always be one active faction each of civilians/scientists, criminals and law enforcers. This can, respectively, be broken down into Superego, Id and Ego. Sci-Fi Name Buzzwords: And how! Set names like Celestial Sled and Pulsar Charger are the norm here. Space Base: Played straight by all criminal factions, but with few exceptions all factions have stationary planetary bases; The rest just arent terribly villainous. A couple even have space monorails! Space Plane: Given the art depicting spaceships navigating atmospheres and the absence of specialized sets for planetary launches theres no reason to believe that any of the ships cant break orbit under their own power. Spacesuits Are SCUBA Gear: Helmets, hosed oxygen tanks and cool uniforms are the only things between a minifigure and the cold, unforgiving void. Standard Sci-Fi Fleet: No set builds a craft bigger than a scale corvette or frigate (probably due to the economy of making sets large enough to accommodate larger craft), but everything from there down is represented fairly thoroughly. What Could Have Been: Many concepts for Aquazone were originally created for use in a Space theme, Seatron, taking place on an aquatic planet. However, when Aquazone was actually released, it was as a separate sci-fi theme with no stated location. Both the first criminal faction and the first truly defined faction. Blacktrons carry an air of mystery and intimidation with them, which comes just as much from their menacing monochromatic motif as from the lack of additional materials to flesh their characters out. They antagonize the Futurons for unclear reasons. Aerith and Bob: Lets take a look at their sets: Renegade, Invader, Battrax, Alienator, Meteor Mo... Battrax? Black and White Morality / Red Oni, Blue Oni: Played very straight against Futuron, both in sensibilities and actual colors. Black Knight: Invoked by color motif and villainous nature. The Faceless: Blacktron I was the only faction for several years to conceal its minifigures faces with opaque visors. This becomes especially unnerving when contrasted against the bright colors of their peers. Good Colors, Evil Colors: Mostly black with some warm colors, signifying darkness and aggression and directly opposing the white-and-blue motif of Futuron. Space Pirates: Theyre clearly depicted attacking Futuron forces in several places. Motives arent mentioned (short of Blacktron being labeled generally evil) but theft of resources wouldnt be a farfetched assumption. Weapon for Intimidation: Short of a clear yellow window and some sparse yellow appointments every set is stark black. The designs are meant as much for psychological warfare as conventional. Their identities half their own and half grandfathered in from the Classic LEGO Space line, Futuron is a society of civilian scientists and explorers featuring mechanical designs that somehow skirt the lines of both retro and ultra-modern. They often find themselves defending against encroachments by Blacktron I and are known to collaborate with M-Tron forces. Black and White Morality / Red Oni, Blue Oni: Same as Blacktron I entry. Cool Train: The monorail in the Monorail Transport System set. Everything Is An Ipod In The Future: Glossy whites and bright appointments on mostly minimalistic ships make the design philosophy of Futuron seem damn near prophetic. Good Colors, Evil Colors: White and shiny with most of the transparent pieces a deep blue, colors communicating peace and tranquility and opposite the blacks and reds of Blacktron I. Spiritual Successor: Futuron is just as much an overhaul of the Classic line as it is its own brand. Created as a response to the Blacktron threat, the Space Police line stretches past this era and endures almost twenty years in its various iterations. Space Police I set the standard for their mechanical designs and the practice of carrying interchangeable cells aboard all but their smallest vessels. Space Police I emerged in the transition from Blacktron I to Blacktron II and dealt with both in their respective periods of activity. See also: the LEGO Space Police page. Instant Militia: Not confirmed in canon, but their sudden emergence (not to mention some uniform similarities) makes it seem as though they immediately sprung from the Futuron ranks fully trained and equipped to fight space crime. Palette Swap: Their uniforms share the Futuron design but change to more distinct colors evocative of modern police uniforms and squad cars. Prison Ship: With the exception of small, personal transports, Space Police craft carry at least one removable cell for prisoner storage and transport. Sealed Evil in a Cell: Any set including a cell also had at least one Blacktron I minifigure to fill it with. 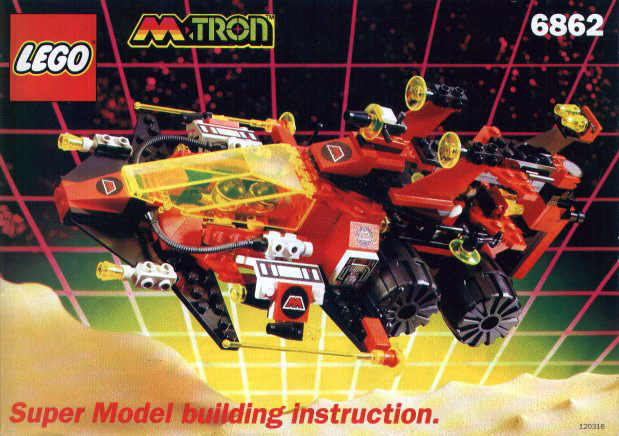 The M-Tron (presumably short for Magnet-Tron) faction introduced magnets to LEGO Space, utilized in sets as a means to grasp various cargo containers easily. M-Trons are a civilian group of nomadic miners and techs who maintain at least one mobile base of operations and harvest precious materials from remote locations, most visibly in the form of transparent yellow 1x1 round pieces. Theyve been seen collaborating with Futuron ◊ and ably defend themselves from attacks by Blacktron II. Asteroid Miners: M-Trons hat (besides magnets, that is). While not specifically mentioned as asteroids, the cratered surfaces and open starfield skylines present in all depictions certainly suggest this. Base on Wheels: The Mega/Multi-Core Magnetizer, a massive 6-wheeled crane/tank. This takes the place of the stationary Space Base of most other factions. Beware the Nice Ones: M-Trons are content to mine and explore undisturbed but arent afraid to stand their ground when threatened. Cut-and-Paste Translation: Though marketed as miners in the United States, outside the US they were marketed as a rescue service. The names were changed to accomodate this: the Stellar Recon Voyager was named the Rescue Star Cruiser outside of the US. Future Copter: The Particle Ionizer has a long, sharp body and a 4-pointed assembly on the top that could be seen either as helicopter blades or some kind of sensor platform. Considering that the overseas name for the set is Cosmicopter, though, the former seems more likely. Gimmick: Magnets; This was done on LEGOs part as an effort to emphasize sets more as interactive toys than static models. Military Mashup Machine: In a more literal sense than usual; A supplemental official instruction book details the process of cannibalizing three separate M-Tron sets (Vector Detector, Celestial Forager and Particle Ionizer) into the Secret Space Voyager ◊, a bulky craft that attempts to combine the utility and style of its component sets. Selective Magnetism: Why dont the magnets attract to ship hulls and personal equipment, too? Its actually not uncommon for technology used in space travel, both in reality and fiction, to be constructed of reinforced ceramics and plastics along with or in place of metal. This still wouldnt explain the ships circuitry being immune to the ravages of powerful magnetic fields, though, but given the general softness of the setting the MST3K Mantra should be all the explanation thats needed. Possibly the same group with a new tech base and new uniforms, possibly a copycat group, possibly descendants of the original Blacktron. The only thing truly known about the nature or motivation of Blacktron II is that they share the antagonistic nature of their namesake. They oppose M-Tron and the scientists in Ice Planet 2002 for reasons known only to them. Aerith and Bob: Giving wheeled land vehicles crazy names seems to be a Blacktron tradition; Just ask the Grid Trekkor [sic] and Tri-Wheeled Tyrax. Ships and mechs are still named with actual words. This doesnt extend to the Spectral Starguider for some reason. Early-Bird Cameo: The Meteor Monitor , a Blacktron I set released in 1990 (as a two-year outlier to the factions other releases), has a design that incorporates small amounts of white; This could be seen as a sort of missing link between the iterations of Blacktron. Generation Xerox: Averted. While the vehicle variety matches its predecessors fairly closely, Blacktron II is its own animal in most other senses. Military Mashup Machine: In the same vein as M-Trons; instructions for the less-than-creatively named Blacktron Super Vehicle detail the combination of three sets (Allied Avenger, Sub-Orbital Guardian and Tri-Wheeled Tyrax) into a larger vehicle. Oddly Named Sequel 2: Electric Boogaloo: Listed on the box as Blacktron: Future Generation. Only oddly named in that no other faction has a name in this format. Space Pirates: Same as Blacktron I.
Markedly more regimented than in their previous appearance, Space Police II features a police force that finally has its own, distinct uniform and new-yet-familiar updates of older vessel designs in a new color scheme. Theyve only been seen in opposition to their fellow second-generation faction Blacktron II, but its possible they also sought out Spyrius agents late in their cycle. Again, see also: the LEGO Space Police trope page. Blew the Budget on Ships: While all craft types from the previous generation have an upgraded model theres no upgraded isolation base, leading one to believe their precincts are still operating on a dated technology base. I guess space tax dollars can only stretch so far. Alternately, the Space Police infrastructure underwent a major overhaul in the intervening years and they no longer operate centrally through a base, but in separate-but-associated cells. Generation Xerox: Design philosophy hasnt changed much between generations, most notably retaining the double-decker cockpit wedge on larger craft. He Who Must Not Be Seen: The Galactic Council, the lawmaking body of the setting who the Space Police answer to (and who are mentioned all of once in a brief flavor write-up in the pack-in catalogs). ISO Standard Human Spaceship: Not so much in design as in color; The newer ships replace the red/black/blue balance motif with mostly gray and black punctuated by small red highlights and green windows. Oddly Small Organization: At least if youre of the mind that every set is a one-of-a-kind ship in the setting, as Space Police II has one of the lowest number of sets in the Space theme. If not its more a case of Oddly Non-Diverse Organization, and with the general theme of increased regimentation this seems the more likely possibility. Prison Ship: In small scale, the same as Space Police I. Red Shoulders of Leadership: Galactic Chief wears a striking red pair of naval-style epaulets over his spacesuit. Sealed Evil in a Cell: Possibly played a bit straighter than the Space Police I example; The new cells more closely resemble stasis pods than conventional cells. Space Police: Again, not too hard to guess. The next good/civilian role in the cycle; Ice Planet 2002s sets focus on a group of scientists stationed on the remote ice planet Krysto who research new rocket and satellite technologies while carving out a livable colony from the harsh environment. They fend off incursions by Blacktron II and Spyrius (who show special interest in their satellite tech for espionage) and maintain at least a working relationship with Space Police II ◊. Chainsaw Good: The tool of choice on Krysto for pushing back the ice is the now-infamous orange transparent chainsaw. Cool Old Guy: Commander Cold, the aging Leader of the faction, who has no problem doing his share of the grunt work or leading his men in the defense of their colony. Crippling Overspecialization: The colonists have some space-capable craft in their fleet, but the majority of their vehicles are land-based and rely on skis for locomotion. Dub Name Change: In the UK, Commander Cold is instead named "Commander Bear". Everyone Calls Him "Barkeep": The factions name is not Ice Planet. In fact, the name of the group isnt really mentioned in any of the supplemental material. Good Colors, Evil Colors: Its not as blindingly obvious as with Futuron and Blacktron I, but the dominance of blue and white in Ice Planet 2002 sets marks them clearly as the good half versus Spyriuss black and red. Human Popsicle: Literally in this case! On the far left of this official poster ◊ youll see a Blacktron II agent encased in a block of ice and being carted away. No indication as to whether the science teams on Krysto have devised a working Freeze Ray or if he was frozen in a more natural manner by happenstance. Lost Tribe: Given the similarities in their faction logos and their mutual civilian scientist roles its possible that the colonists of Krysto are a splinter group of Futurons. Orange/Blue Contrast: In the sets themselves as opposed to the art. Pair the blue and neon orange coupling with splashes of black and white and the sets gain a very striking color motif based around balancing opposites. Single-Biome Planet: Krysto; Basically Hoth but with none of the native wildlife. The Smurfette Principle: This was the first Space set to include an explicitly female minifigure, complete with lipstick and earrings. Snow Means Cold: Krysto is covered in snow and ice and is (you guessed it!) cold enough to support them. Thieves and spies, plain and simple. Spyrius grabs information and technology from other factions to further their own (somewhat ill-defined) ends. They show a particular affinity for rocket/missile tech, likely to facilitate a covert intelligence network, and as such show great interest in the research happening on Krysto. Unitron opposes Spyrius openly, having suffered at least one direct attack by them . Flying Saucer: Spyrius favors generally saucer-shaped designs for their spacecraft, notably the Saucer Scout and Saucer Centurion. Possible Fridge Brilliance given a few years consideration; They may have reverse-engineered their ships from stolen UFO technology. Good Colors, Evil Colors: Their sets are dominated by blacks and reds opposite the prevalence of white and blue in Ice Planet 2002. Faction alignments are played straight here. Humongous Mecha: The Robo-Guardian, in place of the usual flagship set. Perma-Stubble: Spyrius Chief sports some in addition to a classy mustache. Punny Name: "Spyrius" appears to be a portmanteau of "spy" and "Sirius." Robot Buddy: The red Spyrius droids. Theyre never mentioned by a proper name, so unlike the Explorien counterpart it can be assumed that there are several. Space Pirate: In the same general vein as the Blacktrons but with more of a focus on espionage. Spy Satellite: Employed by Spyrius and deployed via remote rockets. The Spyrius base set is a launch facility for one such rocket. An interstellar paramilitary group and the designated successors to Space Police II as the good faction. A disorganized release schedule, short set list and shortage of fluff left this faction woefully underdeveloped despite recalling elements of old fan favorite sets and creating one of their own. Unitron is primarily seen combating Spyrius on their home turf. Cool Shades: Unitron Chiefs got some nifty space-mirrorshades. Cool Train: The Monorail Transport Base features a space monorail, evocative of Futurons Monorail Transport System. Early-Bird Cameo: The Monorail Transport Base set was released early in 1994 along with the bulk of the Spyrius sets, a good several months before the rest of Unitron and before the factions name was even published! More Dakka: Unitrons MO is to load down ships with weapons for effective offense and defense. Oddly Small Organization: Probably more of an Oddly Non-Diverse Organization, same as the Space Police II entry. Civilian scientists (with a specific bend towards xenoarchaeology this time) and Spiritual Successors to Futuron in both design and cycle role. 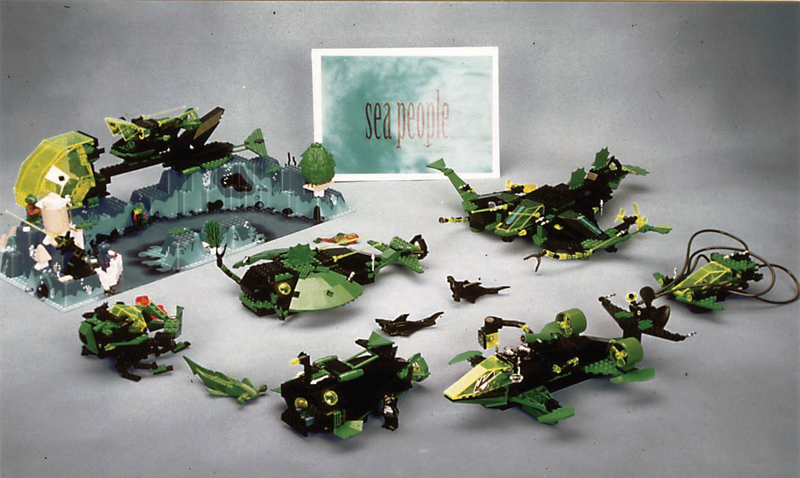 Exploriens sets made use of colored transparent pieces in a new way for LEGO: Multicolored pieces (alien fossils in the setting) were prevalent in this factions sets, and when viewed by the naked eye or under red or blue filters they would reveal one of three different images. One of the planets they visit seems to be home to the UFO aliens, whose ships the Exploriens discover emerging out of the planet's rock formations. One mention of Alien Abduction and a catalog depicting a UFO ship destroying the Explorien Starship hint at an antagonistic relationship between the two factions. Exactly What It Says on the Tin: The Exploriens flagship, Explorien Starship. Family-Friendly Firearms: Shop at Home catalogs of the time persistently tried to pass off the larger sets' prominent cannons as "telescopic lasers" similar in purpose to ordinary telescopes. Gimmick: The red and blue color filter scanners. Humanoid Aliens: Surprisingly averted; The fossils (an embryo in an egg and a lizard-like head with sharp teeth) seem to indicate that the race in question is saurian in nature. Insufficiently Advanced Alien: One of the fossils depicts a creature eating a bone. Assuming that all fossils depict the same species it doesnt seem likely that they got very far. Punny Name: Ann Droid, the resident robot helper and second confirmed female in LEGO Space (female personality, anyway). Red Herring: Story supplements mention that Anns brother/companion unit, Andy, disappeared. Given Spyriuss penchant for technology theft and the fact that the robot minifigures in their sets are near spot-on doubles of Ann youd think Andys whereabouts obvious. ...Turns out he was abducted by the UFO aliens. Spiritual Successor: To Futuron, with predominantly white hulls and blue and yellow neon appointments to their ships and structures, not to mention the shared scientist role. A bit of a Sequence Breaker, skipping the usual villainous faction in favor of another heroic one. 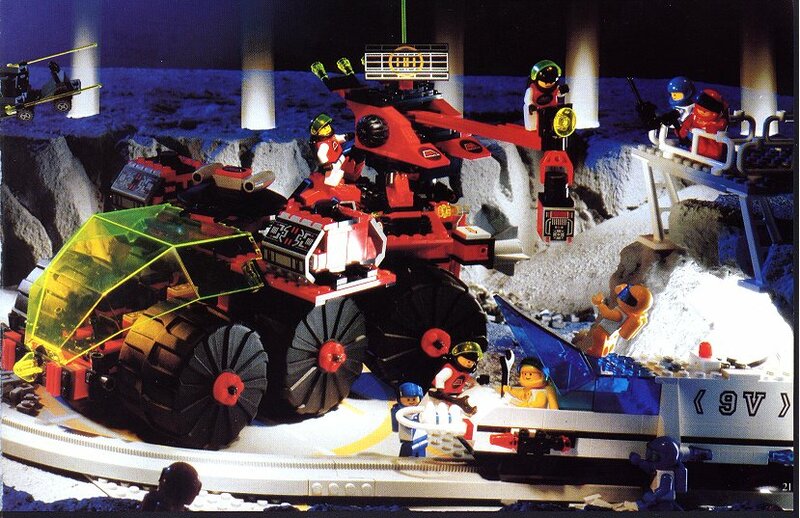 Roboforce was unique in their sets focus on terrestrial vehicles, specifically giant robots. Not explicitly listed as military or civilian, Roboforce fills an almost municipal role on the interstellar stage, with separate teams acting as a search-and-rescue force and a sort of space Home Guard. Likely at least a partial inspiration for the Exo-Force theme. The Ace: Implied of Green Class, given their role in more military situations, not to mention their sunglasses. Animal Mecha: Both Green Class unit types have animal-inspired designs. Color-Coded for Your Convenience: Roboforce is divided into two classes: Orange Class units are delegated to municipal rescue and domestic-level tactical situations; Green Class units manage heavy combat usually reserved for militaries. Each class has theme-colored mecha and pilot uniforms. Cool Shades: Mirrorshades seem to be standard issue for Green Class Roboforce pilots. Humongous Mecha: The general theme of the Roboforce faction. Oddly Small Organization: Same as above entries. Phlebotinum Battery: All Roboforce mecha are fueled by robo disks. Dont think about it too hard. Shout-Out: The Robo Master set contains a small escape vehicle with a sweep wing design very similar to the Unitrons Star Hawk II. Popular opinion is that this was done as a nod by LEGO to the surprising reception of the previous set. 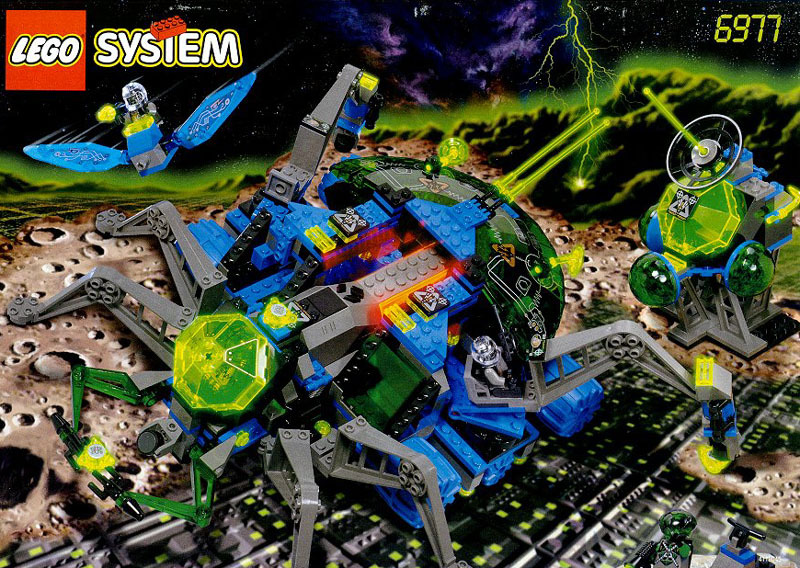 The first aliens to actually see release in LEGO Space, they apparently hail from (or at least reside within) the strange green planet the Exploriens are studying. The aliens of UFO are painted as an aggressive, militant society through their mechanical designs, vessel names, and if that wasn't enough, one catalog even shows them engaging in combat with the Exploriens the moment they see them, targeting their main starship and blasting it into pieces. Alien Abduction: Confirmed with Andy Droid; Other instances possible but never explicitly mentioned. Amazing Technicolor Population: Skin colors include transparent orange and green; Whether this is due to Bizarre Alien Biology or cybernetic enhancements is never made clear. Awesome Mc Coolname/Names to Run Away from Really Fast: Alpha Dragonis, the faction Leader. Cyborg: Their entire race is heavily mechanically modified to the point where (when combined again with possible Bizarre Alien Biology) its hard to tell where cybernetics end and natural features begin. Everyone Calls Him "Barkeep": They likely dont refer to themselves as UFO, but for as mysterious as they are it may be their placeholder name for other factions. Flying Saucer: Played completely straight with the Cyber Saucer and invoked with the Interstellar Starfighters forward hull. Don't forget the Alien Avenger ! It screams flying saucer. Long-Lost Relative: Andy Droid, the brother/companion unit to the Exploriens Robot Buddy Ann, was modified into the red droid present in UFO sets. Name's the Same: The UFO V-Wing Fighter predated the Star Wars V-Wing Fighter by eight years, and the first LEGO set of said Star Wars vehicle by nine . Shoulders of Doom: Armor with generous, imposing shoulders (resembling the original Green Rangers chest shield/armor) is standard issue. The last set in the traditional LEGO Space theme. Insectoids features a race of alien nomads, the Zotaxians, displaced from their home planet after losing a Civil War against their unjust ruler. They escape to Holox, a planet full of hostile giant insects called Bilgen Bugs and adapt their technology to camouflage themselves with their new environment and to assist in the process of digging to the inner sun of the planet to tap its energy. Alien Animals / Big Creepy-Crawlies: The Bilgen Bugs; Theyre never seen, but given the size of some of the Zotoxians converted ships and tanks theyve got to be massive. All There in the Manual: Dont expect to glean much of the fluff from the sets themselves. Amazing Technicolor Population: Three of the Zotaxian minifigures have bright blue skin, while three have dark grey skin. Animal Mecha: Many sets, specifically the larger ones, are modeled after insects. This was a choice of necessity, not style. Base on Legs: The Arachnoid Star Base ◊. Cyborg: Similar to the UFO aliens, the Zotoxians entire race seems to have cybernetic qualities. Its a bit easier to tell which parts are which this time, however. The Turkish and New Zealand catalogs tell the story described at the beginning of this section, albeit in less detail. The Dutch catalog tells the same story, only the Zotaxians are instead called Otopians. The British catalog gave the characters names like Captain Zec, Insector Leon, Insector 2, and Commander Webb. The Voltstones are found on the surface of the planet Armeron, where they are created by lightning striking the planet's surface. As did the German catalog, even though Insector Leon became Techno Leon and Commander Webb turned into Professor Webb. The remaining names were identical to their British counterparts. The story described in the [[www.miniland.nl/LEGOclub/lego mania magazine sep oct 1998.htm September-October 1998 LEGO Mania Magazine]] in the United States is perhaps the most different from that in other countries. Instead of being treated as protagonists, the Insectoids are treated as creepy alien mischief-makers. Gypsy Moth (Insector 2 in the British story treatment) is treated as the Insectoid Queen. Dub Name Change: In some countries' catalogs, the Zotaxians are instead called Otopians. The set names also vary by region. Going Native: The Zotaxians are not Insectoid Aliens themselves, nor were their vessels originally modeled after insects; They converted their ships to mimic the Bilgen Bugs appearances to blend in and avoid attacks. Hollow World: Holox contains varied environments beneath its surface. The planetary crust surrounds the inner sun core and the radiated energy is absorbed by crystalline Voltstones facing inward on the inside of the crust. Hornet Hole: The planet Holox, with its hole-covered surface, giant insects, and internal energy stockpile, is probably meant to suggest a beehive. Insectoid Aliens: Played straight by the Bilgen Bugs native to Holox, but averted by the Zotaxians as described above. Intercontinuity Crossover: The "Adventures of the LEGO Maniac" comic from the Insectoids issue of the Mania Magazine (linked above under Cut-and-Paste Translation) includes a crossover with Scooby-Doo, of all things, in order to promote a Scooby-Doo-themed sweepstakes that LEGO was holding. Meaningful Name: Gypsy Moth, the splinter Zotaxians leader: Not only is her name somewhat prophetic of her factions fate (gypsies being known as wanderers and moths foreshadowing the Bilgen Bugs and the impending technological conversion), but the gypsy moth is known for flying through both day and night, a tenacious and industrious trait the Zotaxians must match in order to survive on their new home planet. Named After Their Planet: Zotaxians originate from the planet Zotax. Phlebotinum Battery / Power Crystal: The Zotaxians seek to convert the planets Voltstones into a power source. Some Kind of Force Field: The Zotaxians build these around the holes in the planet Holox to keep the Bilgen Bugs inside. Spider Tank: The Arachnoid Star Base, which doubles as the Zotaxians Space Base.